Natasha has played the cello since the age of seven. This afforded her the opportunity to benefit from the wide range of experiences of a variety of tutors. A love and enthusiasm for music inspired Natasha to join Chichester University where she read Music, and graduated with a BA (Hons). Natasha has played with numerous ensembles, including the Southend Philharmonic, the Bewick Orchestra and the KEVI Community Orchestra. She has also played in cello and string quartets, performing at award ceremonies, weddings and festivals. Natasha's appreciation of a broad range of musical genres was demonstrated when she worked on a studio album with the alternative rock band 'ArtGruppe'. Welcome to the website of Natasha Orchover. 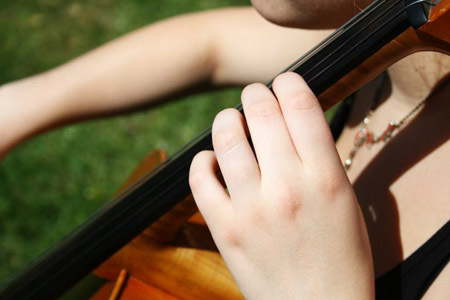 Natasha provides one-to-one tuition for cello and music theory in the Rothbury, Northumberland area. Clarification of the services Natasha Orchover provides; cello and music theory tuition for all ages. This page also reveals the current fees charged. Contact details for direct communication, a web form designed for enquiries and a map of Natasha's teaching location in Rothbury, Northumberland. Read some testimonials of Natasha's musical and teaching ability, provided by past and present pupils and colleagues.